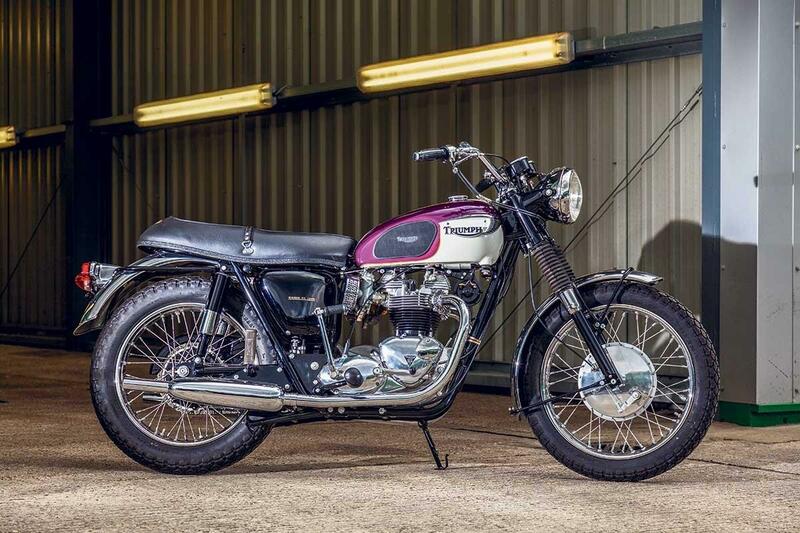 This 1967 Triumph T120R Bonneville is the work of Keith Martin of Big D Cycles in Dallas, Texas and was restored using as many of the original parts as possible. In fact, the only original parts missing were the exhaust, tyres, seat cover and bars. It really has to be one of the best restored Bonnevilles to come up for sale recently. Just to make it that bit more tempting, it has only covered around 100 miles since the work was completed in 2014 and has been given a tempting guide price of between £8000 and £14,000 - meaning it's no more expensive than a brand-new Bonnie. Why have the imitation when you can have the real thing? "Neglected when found, this now-pristine Bonneville, finished in the correct Aubergine Purple and Alaskan White, retains its original fuel tank and mudguards, repaired as needed and brought back to 'as-new' condition. "The original wheel rims were re-chromed and re-laced, and new-old-stock components from Triumph, Lucas, and Amal were used as needed, all properly date-coded for the 1967 model year. "Only the tyres, seat cover, handlebars, and exhaust system are top-quality reproductions. No detail was overlooked in making this as accurate a restoration as possible. "The current vendor purchased the Bonnie at Bonhams' Las Vegas sale in January 2015 (Lot 118). At that time it was stated that approximately 100 test miles had been logged, and that the machine was well sorted and ready to ride or show."